My LFCHistory by Chris Wood - LFChistory - Stats galore for Liverpool FC! On Tuesday 2nd December 2014 I watched a Liverpool team play live for the 1,000th time. This personal landmark came 47 years and 343 days after the first occasion (Chelsea v Liverpool: Saturday 24th December 1966) and gave me an opportunity to look back and reflect on what has been an extraordinary journey covering tens of thousands of miles on the British mainland as well as numerous trips to different countries within the continent of Europe. It is only quite recently that I have taken a keen interest in football statistics. However, I have kept a record of every football match I have seen for over fifty years. Recording the basic details of each match is a habit I still stick to today each time I return home after watching a match. So how did my first Liverpool match come about? Well, probably more by luck than anything else. My secondary education was spent at a rugby-playing boarding-school a long way from my home. So my opportunities for watching any soccer match were very limited. Both my parents knew I was ‘football mad’ as a boy growing up but they had other things to deal with at the time. After my parents’ divorce my mother re-married and went to live in London with her new partner. The luck was that I would be spending Christmas in London in 1966 and that Liverpool were playing Chelsea at Stamford Bridge on Christmas Eve. So I was in the right place at the right time and my mother and step-father bought tickets and the three of us travelled across London to watch the match together. I had been to Stamford Bridge once before earlier in the season but I had never before watched Liverpool play live so this was the culmination of a dream really. I have kept my match-ticket and programme and can still remember a lot about the day. I was aware that Liverpool supporters had something of a reputation for noise and colour and I know I was definitely impressed to see several hundred of them march into the middle of Chelsea’s notorious Shed and stay there for the whole match, despite several attempts by the home fans to get them to move. This match was chosen by the BBC to be its “Match of the Day” on this Saturday evening and I was allowed to stay up to watch it (that did not always happen!) For the record the first Liverpool goal I saw live was an own-goal by Chelsea defender Marvin Hinton. The first Liverpool goal I saw came from Geoff Strong about twenty minutes later. John Boyle pulled a goal back for the home team in the second half but our defence held firm and one 14-year-old boy travelled back to his Christmas base with an enormous smile on his face. I went to live and work in London after leaving school and soon made contact with the London Branch of the Supporters’ Club which at the time was the only branch outside Liverpool. They ran coaches to some away matches in the Midlands and this enabled me to attend a number of away games in the second half of the 1969-70 season. After seeing defeats at Nottingham Forest, Watford, Arsenal and West Ham I finally broke my away-day jinx with a win at Wolverhampton on Easter Monday. By the end of the season my total of Liverpool matches had risen to thirteen. I got to 45 Liverpool matches in 1970-71 despite every trip to a home match involving a round trip of 400 miles and having a tedious job that was not well paid at all. That would soon change. As the 70-71 season progressed I began to notice a number of supporters who seemed to be at pretty much every match and I got talking to them on the trains to and from different locations. A few of them worked for the Railway and I learned that they received very generous travel concessions which saved them a lot of money. In the summer of 1971 I became a Railwayman myself and started to make good use of those concessions. In the three seasons after changing my job I went to 34, 55 and 49 matches and by the end of the Seventies my grand total had reached 357. The Eighties were not so productive (only 179 games to add) but the Nineties was a period in which I did not miss a home match for over 7 years in any competition and by the time the season in which the Millennium arrived had finished my grand total was up to 842. I started to think seriously about whether it might be possible to get to a thousand live Liverpool matches. Life changes for all of us and we take on different responsibilities as we get older that affect our ability to spend huge sums on leisure activities. Football was changing too and it was becoming harder to get tickets even for ‘ordinary’ matches. In the Treble cup season I got to just 17 matches but in 2002-03 I only went once, not because I had lost interest but because other things were getting in the way. Then towards the end of the 2005-06 season I was admitted to hospital after suffering a stroke at home and spent the next four months lying in a hospital bed not knowing if I would ever walk again never mind go to football matches. When I was discharged from hospital in August 2006 I was stuck on 897 Liverpool matches. Sheer bloody-mindedness and determination got me to 6 matches in 2006-07 and I averaged 14 matches for the next six seasons to take me up to 985. So as the 2013-14 season dawned I knew that getting to a thousand was a probability more than a possibility. Not wanting to miss out I told myself that just five matches a season for the next three years would get me there. More determination saw me knock off those final fifteen matches in half the time I had set for myself. So I travelled to Leicester on the first Tuesday in December 2014 with a precious match-ticket in my pocket knowing that in a few hours time I would reach a milestone that was very precious to me even if it meant nothing to anyone else. As good fortune would have it I started with an away win and I finished with an away win. If finish suggests that I will declare on one thousand not out, that is inaccurate. I won’t stop caring and I won’t stop going but I think I will be quite selective about what I see from now on because the last hundred or so matches have been tremendously hard on me physically. I don’t regret going through the pain-barrier to watch Liverpool though. We all do that in different ways. I am proud of the way I have pushed myself on to the 103 matches I needed after leaving hospital, especially as two of those matches were outside the United Kingdom; and during the same period I also managed to get to Iceland to see the stadium where LFC’s incredible European journey began in August 1964. Chris attending the last stand of the Kop on 30 April 1994. I was only eleven years old when Liverpool played in Reykjavík but I have taken a keen interest in European football for a long time. If I am going to finish with a few statistics I am especially pleased that I have seen Liverpool play over a hundred European competitive matches and that total includes the first three European Cup finals and all three UEFA Cup finals. I have seen 661 League matches, 68 in the F.A. Cup and 54 in the League Cup. A category I can only call Other takes in 115 matches, many of which are pre-season friendlies abroad. I have seen 602 victories, 232 draws and 166 defeats. I have seen 683 home matches, 282 away matches and 35 matches at neutral venues. I have seen Liverpool play against 182 different opponents (from AEK Athens to Zurich alphabetically) and I have seen Liverpool teams score 1891 goals. My highest scorer is Ian Rush with 159 followed by Robbie Fowler (110), Kevin Keegan (67), John Toshack (65) and Kenny Dalglish (59). A big thanks too to the fifty-three men who kindly put the ball into their own net to help push my overall win percentage up to over 60%. The fixture I have seen most is Liverpool v Everton with a total of 39 matches (24 home, 11 away and 4 neutral) followed by Southampton 37 (25,11,1) and Tottenham Hotspur 36 (26,9,1). Three more London clubs (Arsenal, West Ham United and Chelsea) are in the next five numerically, mainly because of all the matches I was able to see in the capital during the fourteen years I lived there. And that’s my LFCHistory. And I don’t regret one mile of any journey or one minute of any match. I would not really change anything because I know I have been lucky. I have met some amazing people, seen some amazing places and witnessed things that supporters of most other clubs can only dream about. The whole experience has been life-changing and life-enriching. What started at Stamford Bridge on Christmas Eve 1966 brought about a wonderful chain of events that is actually quite hard to take in when I try to look back at it all. So what was the best match I saw? Well, clearly the first match and the one thousandth match stand out for those reasons. But I witnessed many great team performances inbetween. I will always regret missing the 7-0 over Tottenham in 1978 but I did see the 9-0 over Crystal Palace eleven years later. It would be easy if rather lazy to choose one of many successful cup finals or a match that clinched a championship. The 3-1 win at Wolverhampton in 1976 fits neatly into the latter category while the two 4-3 home victories over Newcastle in the 1990s were quite extraordinary. In the end I will go for three matches in which Liverpool’s opponents also played a huge part; the 5-3 First Division win at Norwich in 1980 in which Justin Fashanu’s remarkable goal somehow eclipsed a David Fairclough hat-trick; the 6-3 Anfield win over Sion in the Cup Winners’ Cup in 1996; and another nine-goal thriller, the 2001 UEFA Cup final in Dortmund. And the best goal? Again, it would be easy to choose a goal that won a cup or a goal that meant something really special. David Fairclough (against Saint-Etienne), Tommy Smith (in Rome) and Alan Kennedy (in Paris) are three worthy enough candidates. McDermott against Spurs in 1978 & 1980 (if I had seen them!) are other special goals. I recall that Phil Boersma scored a remarkable solo goal against Stoke City at Anfield in 1974. Boersma went through several tackles before sliding the ball past John Farmer. Jan Mølby’s thunderbolt nearly took the net off the Kop goal guarded by Norwich City’s Bryan Gunn in 1991. But I am going to go for a goal that very few Liverpool supporters witnessed in the iconic setting of the Olympic Stadium in Berlin, the date was 14 August 1973 at a time when that stadium still looked pretty much as it had done for the famous 1936 Summer Olympic Games. 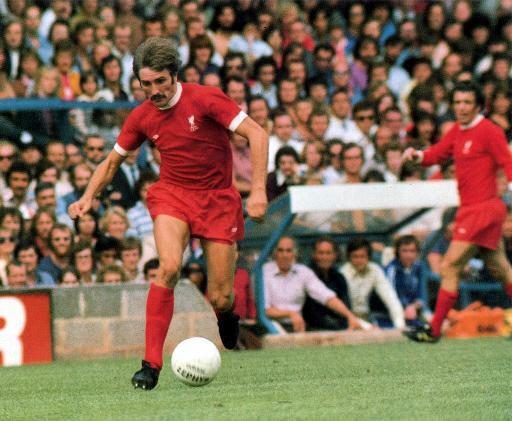 Steve Heighway collected the ball just inside the Hertha Berlin half, made straight for goal and danced past several German defenders before calmly placing a shot past the home goalkeeper. It was only a pre-season friendly and there were less than 20,000 spectators present but I was mesmerised by an extraordinary piece of skill. Even though forty plus years have elapsed I don’t think I have ever seen a better goal scored by a Liverpool player. Better team goals certainly. Harder shots, yes. Better skill from an individual, no.